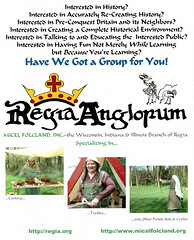 Thanks for expressing an interest in Micel Folcland and Regia Anglorum! This page is an attempt to answer a few basic questions. Keep in mind that Regia, like all other living-history groups and most other subcultures, uses a set of specialized jargon; if any term is unexpected or confusing, please feel free to ask what it means. We’ll understand; after all, we all stood where you stand today! “Living History” is a term used to describe the re-creation of historical cultures in the present. It generally involves costumes of the era and pursuing the crafts and other activities of the period. You might be familiar with American Civil War or American revolutionary war reenactments; these are living history. Regia does the same thing, only earlier! Regia Anglorum is an international society that attempts to recreate a cross section of English life around the turn of the first millennium. Regia attempts to re-create British culture between 950 and 1066 ce. While this primarily focuses on Norse, Anglo-Saxon and Norman cultures, any culture with a presence in the British Isles during this time is fair game. Regia is not purely a combat society and have come a long way from the old hack and bash image associated with many re-enactment societies. There is always a certain glory to be found in recreating and reliving famous and the not-so-famous battles of times past - but they are not the sum total of history. They are specific points in time which were interspersed by long periods where the people living then, got on with their normal existence which is equally fascinating. In this way, we are not in fact just a battle reenactment group, but a broad living history society. A large consideration for Regia is accuracy in all aspects of the recreation. Some folk prefer the term “authenticity,” but we feel this sounds more as if we are using the actual historical artifacts. We employ replicas, but they are as close to the originals as possible. The exceptions are if you have to extrapolate because of a lack of primary documentation and matters of safety. Safety is paramount. Because we deal with such a limited time span and geographical area, we are well able to advise each other on questions of accuracy. Actually, creating and maintaining an accurate period kit becomes fairly simple because of the internal help and support! We do have a list of standards which all members and potential members must obey. For more information on the society and on the era, see http://regia.org. Micel Folcland—Old English for “Great Land of the People,” a variation of the meaning of “Illinois”—is the official Wisconsin-Indiana-Illinois branch of Regia Anglorum. Regia is a British-based living-history organization founded in 1986. It spread to North America in around 2002, and Micel Folcland was given its official land grant in the December of 2005. The culture of Micel Folcland is primarily Anglo-Scandinavian (the Danelaw) from the early eleventh century, so most resources will be devoted toward that culture at this point in time. For more information specifically about Micel Folcland, see http://www.micelfolcland.org. Regia is not role-playing in the sense that events usually does not feature first-person impressions (also known as persona, the character you “portray” in Regia). Regia is not a modern political organization of any kind (we only study politics from before 1066). Regia is not a modern religious organization of any kind (we only study religious topics from before 1066). How expensive is participation in Regia? We often hear the question. And quite frankly, that depends on the individual. The Early Middle Ages is one of the least expensive eras that you can recreate, but doing a higher-class impression, buying all your kit can be as expensive as any other hobby (after all, most other hobbies require the purchase of some specific gear). However, if you are willing to do a lower-class impression and to make your own gear, expanses can be minimal. We encourage members to do ordinary and common impressions in any case. We do research into the era we re-create, and we put it to practical use. By that, I mean that we have events! Regia, like most other living-history groups, primarily does shows for the public. However, this does not mean that we do not do private events as well, when standards are less. These are “Hearth Nights,” when members gather to practice arts, experiment and just to socialize. During events, the period camp is usually enclosed by a ropeline which keeps the public out. Everything seen in the period camp will be accurate, although non—period materials—farb—is allowed if it is kept from public view. For example, each camp must have a fire extinguisher that is kept hidden in a red bag. Virtually anything done in period times—that is still legal today—is done in Regia. Archery, horsemanship, cookery, calligraphy, combat, music, dancing, textile arts and of course costuming are practiced in Regia. Combat is done with rebated—blunted—steel weapons with specific rules and much training, and safety is paramount. Sharp weapons—so-called “live steel”—are not permitted. Armor, if used, is primarily chain mail and helmets; leather combat gloves are not period but are used for safety reasons. Combat is not competitive but is not choreographed. Artifacts are usually based on primary documentation, principally archaeological finds but also on illustrations, literary accounts and, in some cases, practical extrapolation. To participate in a Regia event, you must be member. Micel Folcland allows non-members at two events to see if they like it. That way, if it turns out that someone does not like doing it, they’ll have a chance to “try it on” for free. Memberships are $35 a year, running from October to October and include our journal, membership booklet and more. There is, of course, much more to Regia and its activities. You can find a Micel Folcland FAQ at http://www.advancenet.net/folo/micel_folcland_faq.htm. If you have any other questions, please feel free to ask them, and we’ll try to answer them!